Given the extreme travel day of yesterday (waking-up at 3:30 AM, traveling to a different country, and then performing two concerts) we asked our guide if we could amend the schedule. Originally, the schedule had a 2 1/2 hour drive to Nizwa, the birthplace of Islam in the Sultanate of Oman, and site of a famous 7th century fort. This would mean over 5 hours of travel on a bus for the day. We were able to rearrange three activities: one group could leave at 9:30 AM if they were interested in going to a beautiful Omani beach, or another group go to a local Omani mall for an opportunity to pick up items not available in the States, or the third group could simply sleep in until we left for the day at 12:30 PM. 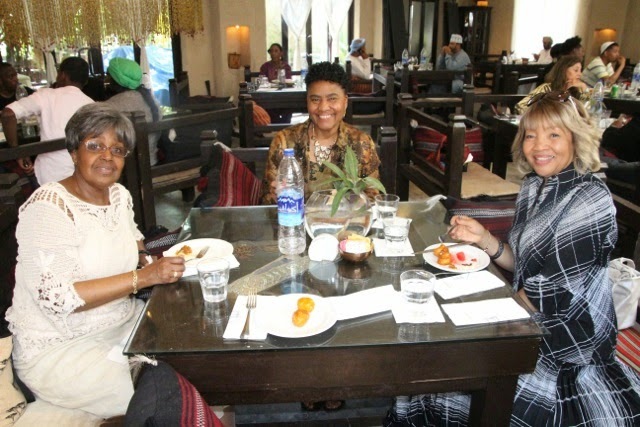 Needless to say most of the group stayed in the hotel to rest for the important concert in Muscat. We left our hotel at 12:30 PM to travel for a group lunch at a restaurant named Kargeen cafe. Once again we ate at another buffet featuring typical Omani cuisine. 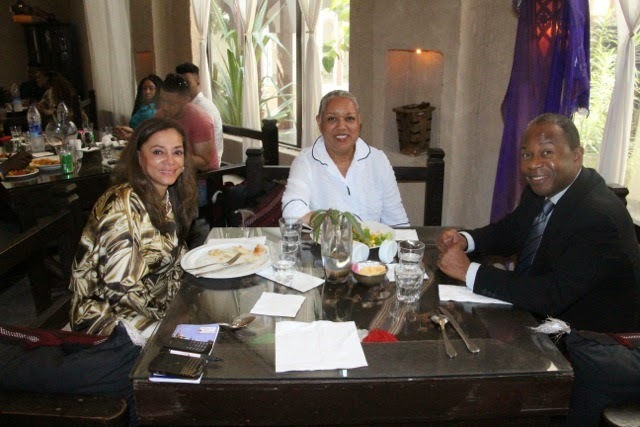 The setting of the restaurant was very beautiful and we enjoyed great conversation over the meal. 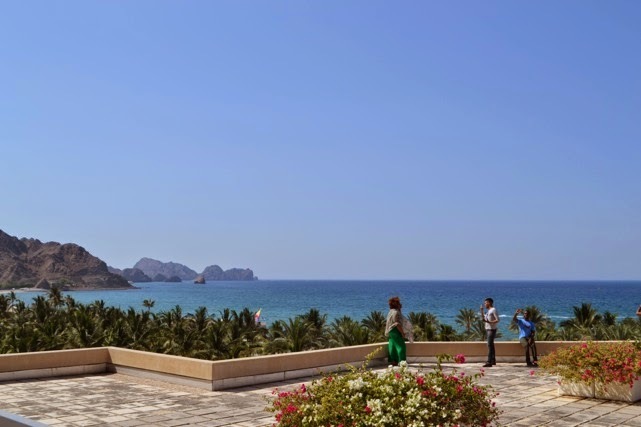 After lunch, we had a thirty minute drive to our concert location, Al Bustan Palace Ritz Carton Hotel in Muscat. This Ritz Carlton was not a five-star, but a six-star hotel! 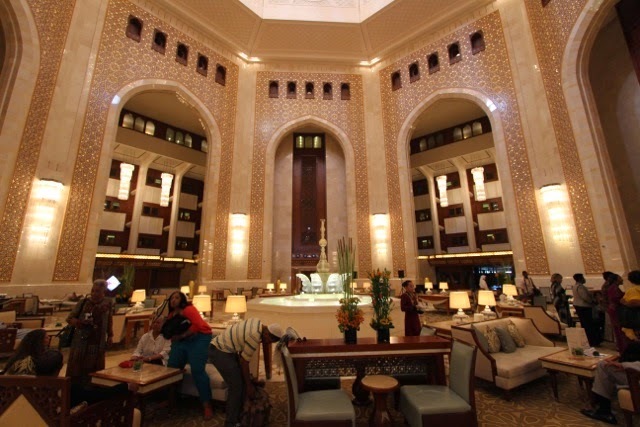 This is the hotel where kings and queens stay when they visit Muscat. We sang in the main open space of the hotel. 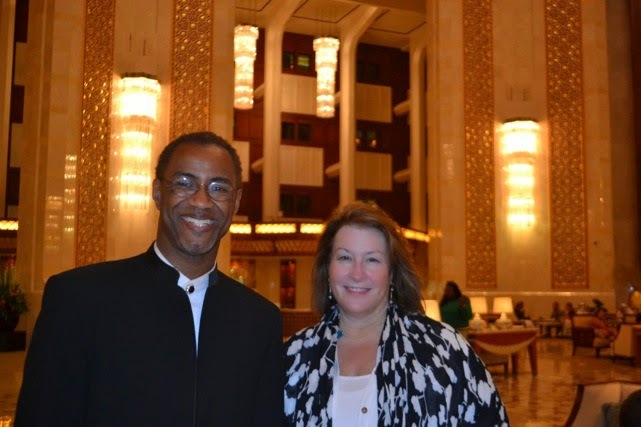 The United States Ambassador to Oman, Great C. Holtz, arranged this concert. She invited at least 100 guests to this concert, who apparently all showed-up. The lobby of a hotel does not sound like an attractive venue, and to be honest, I was initially perplexed why we where singing in this space. However, this is the most opulent hotel in the country. The acoustics, although rather reverberant, where quite attractive for our music. When we were singing in the space, one could hear a pin drop. Occasionally you would hear the cry of little children who where thoroughly enthralled with whatever they thought they were seeing for the first time. 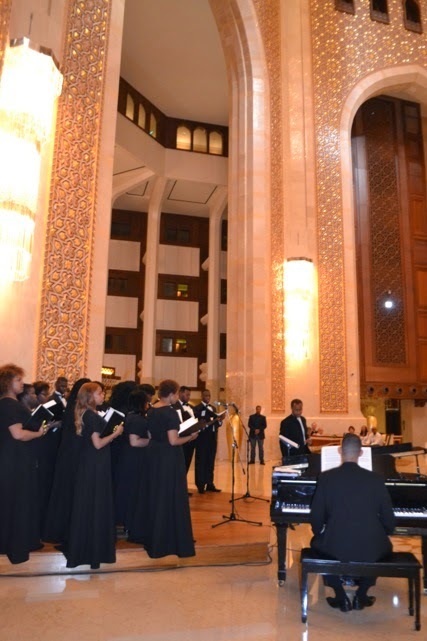 The US Ambassador said that this was a perfect gift of music to the Omani people. She said that during the music she experienced the entire gamut of human emotion through our music. 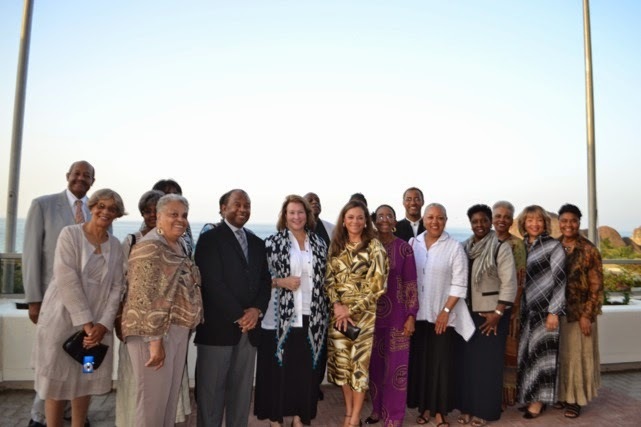 She spoke to the directly to the choir while taking a photo with the group, and invited us back to sing at the country's premier venue in Oman, the Oman Opera House. 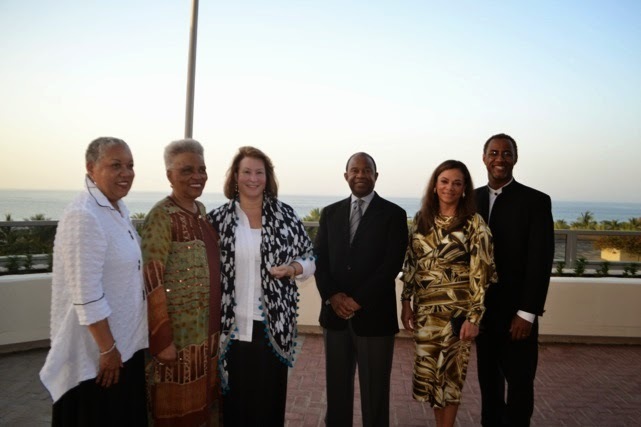 She said that she would work fervently to make sure that we would return to Muscat for a much larger audience! After the concert, we returned to the hotel to relax. Many went out to the various restaurants in the area. Many simply went to the Olympic-size pool where the temperature of the water was "perfect". Tomorrow will be a day of surveying the main sites of the country, after these three concerts in two days in Muscat. P.S. Please see email below from someone who attended our concert last night at the American School in Muscat who "can't stop smiling today" after hearing our choir! 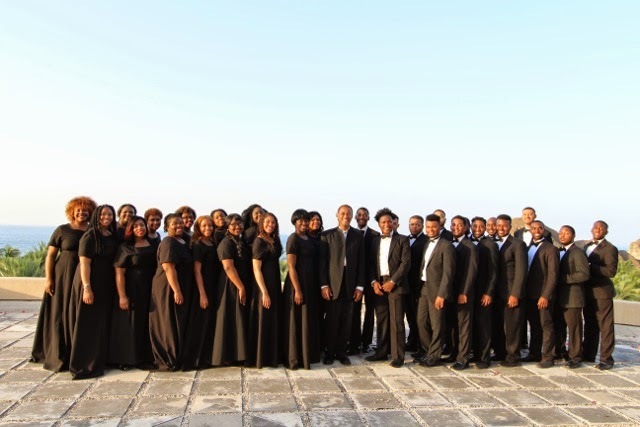 Subject: Hi - will MSU choir perform in Dubai? 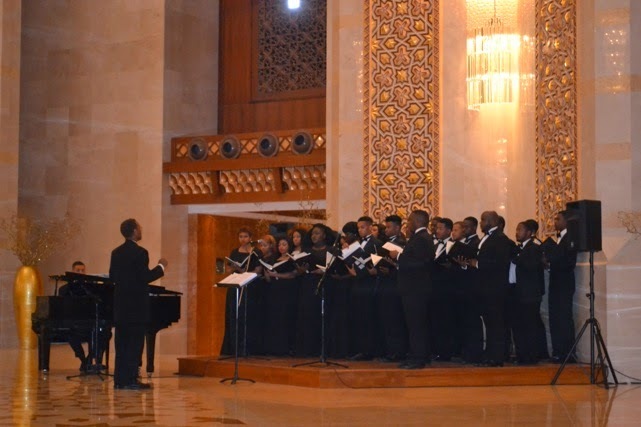 I was fortunate to be one of the audience at your choir's concert last night at the American School in Muscat and can't stop smiling today - it was tremendously moving and inspirational - thanks to you and every member of the choir! I'm an American (an ESL lecturer at Sultan Qaboos University) and haven't felt so proud of my country in long time - such talent and dedication and beauty! Even my British and New Zealand colleagues said they wanted to be American after that glorious rendition of America the Beautiful! I was in tears. And to see Muslim members of the audience standing and clapping and cheering that Gospel song at the end was a testament in itself. Bless you all! I'm recommending my friends in the UAE to go to your concerts there. I know about the Abu Dhabi performances, but I think you also mention going to Dubai as well. However, I can't find any information online about a Dubai concert. If you get a chance to read this and respond, I'd be so grateful. Thank you all again for the glorious music and best wishes for continued success!